I first discovered Knitty in 2004, and Mariah was the pattern that introduced me to the incredible resource that *is* Knitty. Before Knitty, there were some sources for free knitting patterns on the internet, but fewer than half had photos, and even fewer were enticing enough to knit. Mariah had me at "Hello". I saw it at my [then] boyfriend's cottage, because he was oh-so-cool enough to have DSL, and I printed out the pattern because I knew I *had* to knit it. I might have carried the pattern around with me, and every worsted weight yarn was a potential candidate for My Mariah. 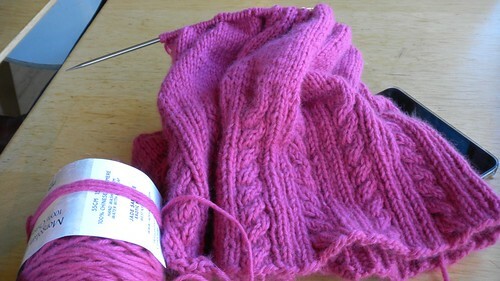 Maybe it was all the anticipation, how could any pattern hold up to almost SEVEN years of dreaming about knitting it. Mariah was my magnum opus**, my "someday I'll be a good enough knitter and I will make this" sweater. I bought hot pink cashmere on sale, and it marinated in my stash WAITING for the day when I decided I was finally ready. 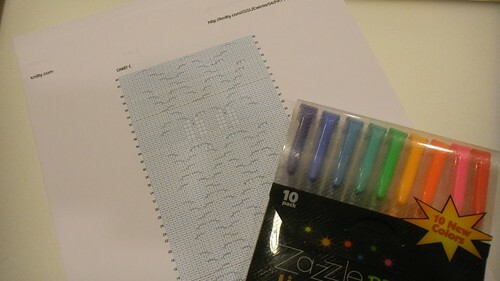 This January, partly because of Jasmin 2011 (but also a little Jasmin 2009). 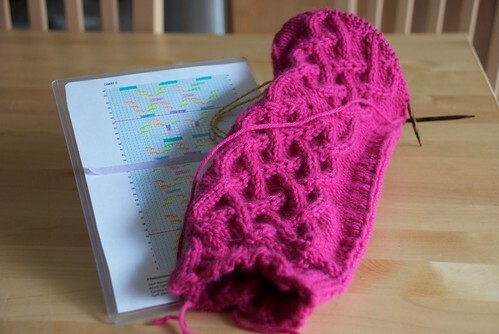 Jasmin 2011 is all about productivity- knitting what I'm inspired to work on, when I'm inspired to work on it. Combined with my Jasmin 2009 goal of using the good stuff now, it seemed like exactly the right time for Mariah to stop being a dream and start being a zippered cardigan. I knit the body in one piece, instead of three. This sweater was brought to you without a cable needle. It's a yoke sweater, so the get-Chloe-to-set-my-sleeves-in time delay didn't apply here. I attached the sleeves and after the first few awkward rows (which they are, at first), my beautiful yoke sweater actually looked like a beautiful yoke sweater. The hood slowed me down, but I kept at it. Finally, it came time to add the zipper, and I was going to do it myself. Three trips to the fabric store later, and four zippers later, with the aid of Caro Sheridan's brilliant tutorial, I applied my first zipper. The zipper install is hardly my best work, and really, my backstitching looks more like highway 17 than a beautiful, straight row of stitches, but it's my first one. I'm going to re-do it when I get the perfect zipper, and my next zipper install will be better, because now that I've done it by myself, it's okay for Mom to help me. You understand. I wove in all my own ends, and despite the fact that it was 78ºF (25.5ºC) and humid (for California) I put it on proudly and bounded over to my mirror to admire my handwork. I hate it. It's boxy and shapeless, and the neckline is AWFUL. You can't see it from this shot, but where the hood grows out of the sweater is weird and floppy, leaving the awful straight-across neckline in a place that doesn't agree with normal t-shirts (I tried two different shirts, no success). The phrase "waste of cashmere" may have crossed my lips. I blinked back the tears of a woman who finally got what she wanted, and realized that it wasn't, quite. "Disappointed" doesn't seem to quite cover it and "devastated" seems a bit melodramatic. However, I had plans with Guido, the charming host of the It's a Purl, Man podcast, and he was not deserving of my bad mood, so I pushed the misadventures of Mariah to the back of my mind, giving it only a brief mention when with a fellow knitter. He could relate. After dinner, where Guido and I discussed the finer points of the difference between a knitting guild and a knitting group, where knitting is going, and whether or not weaving and spinning are the next knitting, he invited me to the Where 2.0 conference, where they were having Ignite sessions. Guido knows how to show a geek girl a good time, let me tell you. The sessions we saw were interesting, engaging, funny, and enlightening. Where 2.0 is at the Santa Clara Convention Center, where Stitches West is held. The SCCC is notoriously over air-conditioned, and I didn't notice. I was wearing my Mariah, and I was comfortable. Maybe we'll come to some sort of agreement. Maybe (with the help of my friends) I'll find a way to make Mariah more fabulous. After all, who *isn't* improved with a few minor nips and tucks? Maybe this was my fault, hyping up Mariah so no matter how great it turned out, I would be disappointed. Nope. Definitely not that. But we'll figure out a way to fix her, or a way to amicably co-exist, because after all, we wouldn't want her to be a waste of good cashmere. **To be fair, it really seems like every successive sweater that I knit is the best/most challenging thing I've ever knit. I'm a little proud of that. From the picture the Mariah seems a little big on you, the picture in Knitty shows it as much more snug. You could add some tucks, but I don't know what you could do about the neckline. The absolute last thing you could do is unravel the whole thing and knit something else. I don't know if I could do that or not. I feel your pain because I to have knit a sweater and after putting it on did not like it. Perhaps we live and learn, that sweater taught me not to do raglan sleeves anymore and to put less ease into my sweaters. Hope you can resolve what you want to do. I love the Podcast and anxiously await each weeks installment. I hear a clock in the background what kind is it, I love old clocks. Mariah was one of my first knotty knits. I was thrilled to communicate with Jodi Green, a real designer and knitter. But mine didn't turn out that well: too big for me and gifted to my niece. I wonder if she wears it? To be fair, it was one of Jodi's first designs and before so much of the innovation of connecting on the web. I'm so sorry about your sweater. I knit it way back when and should have listened to the warning I got from the woman at my LYS. She said the smallest size is fine but the bigger sizes aren't totally right. I knit the entire thing and had a similar outcome as you did. I hope you find a way to fix it and share your secrets with us. DANG! Have you considered frogging it? Oh no! I've been waiting to see the finished sweater after hearing about it so many times on the podcast, and I'm so sorry it is a disappointment. I think it's something that has happened to all of us. 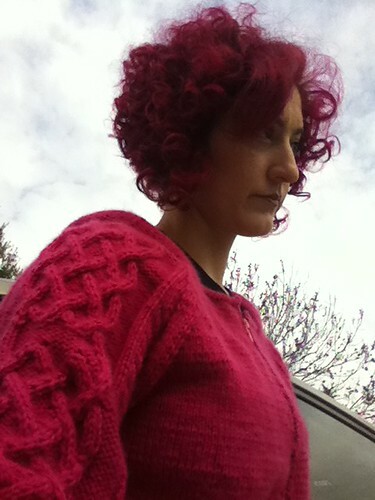 (I know my first adult sweater was one I knit for the first Knitting Olympics. It was beautiful when it was done -- but it hung off me like a wet rag when I tried it on.) I hope you're able to figure out some way to adjust it to make it fit to your liking. At least in the worst case, you can always unravel it and use the yarn for something else, right?